Some specialists like all patients to try a hearing aid first and reserve surgery for those who, for whatever reason, do not get on with an aid. However many patients do not like the thought of having to wear a hearing aid and therefore opt for surgery. The commonest operation is called a stapedectomy or more correctly a stapedotomy. This operation has traditionally been carried out under a general anaesthetic however it is quite possible these days to do the surgery under a local anaesthetic and many patients find this a better option. The surgery is done down the ear canal although occasionally a small cut at the top of the ear canal may need to be made. Using an operating microscope the surgeon lifts up the eardrum. Often a small amount of bone needs to be scraped away to get a clear view. At this stage it is important to confirm the diagnosis and check that it is otosclerosis that is causing the problem. Using delicate instruments and preferably a laser the upper part of the stapes can then be removed. In order to re-establish the chain for transmission of the sound waves a small hole is made in the remaining part of the stapes (the footplate). A tiny piston is then inserted into the hole and attached to the second bone in the hearing chain (the incus). The vibrations from the eardrum can now be transmitted again to the inner ear. A piece of vein or other tissue can be used to help seal the hole in the footplate to prevent leakage of the inner ear fluids. If the operation is being done under local anaesthetic the surgeon can now fold the eardrum back into place and test the hearing at this stage. At the end of the operation a thin ribbon like pack is placed in the ear canal and left for two weeks. It is quite common to feel a little dizzy after the operation although with a local anaesthetic this is usually very minor and many patients feel well enough to go home the same day. Dizziness is usually elicited by rapid head movements and so it is advisable to rest and avoid strenuous activity. It is also worth avoiding anything that might increase pressure in the head like straining or heavy lifting. If you need to sneeze try to do so through your mouth to minimise the pressure effect on the ear. It is customary to stay off work for a couple of weeks although this will depend upon the nature of your work. During this time the hearing is likely to be muffled due to the packing in the ear. 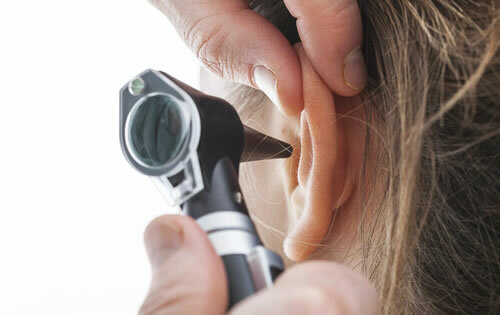 After two weeks the packing is removed from the ear and an improvement in the hearing is usually apparent however it usually takes several weeks for the hearing to settle completely and there are often fluctuations in hearing over the first few weeks. In general the operation is very successful with over 90% of people experiencing a good improvement in hearing. Sometimes the hearing remains unchanged and there is a small (approx 1-2%) chance of hearing loss. Hearing results vary from surgeon to surgeon and it is important to ask your own surgeon about his own results and how often he carries out the procedure. As with all operations the best results tend to be achieved by those who do the procedure most frequently. Dizziness, which is experienced by most patients for a short time after the operation, may persist and become troublesome but again this is a rare complication. The nerve that supplies the taste buds at the front of the tongue can be damaged. Usually this is only temporary but occasionally the nerve will have to be cut and a permanent loss results. The nerve that moves the face is located very near to where the surgery is taking place but it is extremely rare for this to be damaged. Sometimes the nerve may be abnormally sited and this may mean that it is not possible to complete the operation. This is not an exhaustive list and it is important to ask your specialist about other possible risks and complications. The surgery is carried out under local anaesthetic in over 90% of cases. Many people have concerns about lying still for long enough but this is rarely a problem. An anaesthetist is on hand to administer mild sedation which enables most people to relax and often quite enjoy the whole procedure! (see Patients comments). The surgery is carried out through the ear canal and so no external scars are visible. Occasionally, where the opening of the ear is exceptionally narrow, a small cut at the top of the canal is necessary to provide access for surgery. A flap of ear canal skin is raised and the ear drum is folded forward to reveal the structures of the middle ear. The view of these structures can vary and in most cases a small amount of bone will need to be removed to provide sufficient space to carry out the procedure. Whilst this may sound uncomfortable it is completely painless and most patients simply describe a scratching sensation. The nerve of taste (Chorda Tympani) is carefully displaced out of the way at this stage. It is now possible to visualise the stapes bone and the diagnosis of otosclerosis can be confirmed. Using the laser and other instruments, all the attachments of the stapes are divided and the upper part of the bone is removed. A tiny hole (0.6mm diameter) is then made in the remaining, fixed, part of the stapes and a piston around 4.5mm long is carefully placed into the hole and hooked around the adjacent incus bone. 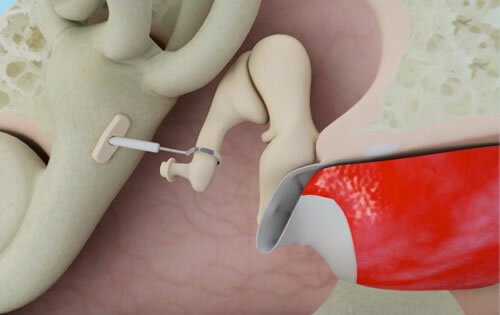 The wire hook is closed to ensure a secure connection and the eardrum can then be replaced and the hearing improvement confirmed (see video). The ear is then packed with a soft sponge dressing. You should be able to hear through this dressing initially but over the next few hours the hearing will drop down. This is completely normal and is related to the blood soaking into the sponge dressing and also collecting behind the ear drum. You will need to place ear drops into the ear for the next couple of weeks to keep the dressing moist and the ear infection free. The vast majority (over 90%) of patients go home the same day as the surgery. When the local anaesthetic wears off there can be a little discomfort but this is generally controlled by simple pain killers (paracetamol, ibuprofen). It is advisable to take things very easy for the next four to five days. Fast head movement can induce a sensation of dizziness. You should avoid anything that might put pressure on the ear. Nose blowing, sneezing and popping the ear should be avoided. It is normal for popping, clicking and squelching sounds to be heard in the ear. This is a normal part of the healing process. In the event of a sudden onset of severe, continuous dizziness and/or a loud roaring or whistling sound developing you should immediately contact the hospital. This is an indication that the inner ear is “not happy” and medication and, occasionally, readmission to hospital may be required. It is common for there to be a metallic taste on one side of the tongue relating to manipulation of the taste nerve. This usually settles after a week or so and will rarely persist longer than a couple of months. It is also quite normal for there to be a bit of bleeding from the ear for a few days. This is nothing to worry about and a small piece of cotton wool placed in the ear to soak it up is all that is needed. A review consultation takes place two weeks after the surgery. The packing in the ear is removed and some ear drops may be prescribed. The hearing over the next few weeks may fluctuate a great deal and for this reason a formal hearing test is not performed until six weeks after the operation. In the first few weeks after the dressing is removed the hearing may feel quite echoey and certain sounds like traffic may be uncomfortably loud. Don’t worry. This will settle over time as the ear gets used to hearing again in the normal way. The ear should be kept dry for at least a month after the surgery. After this the ear can be treated pretty much normally. It is advisable to avoid flying at least until after the hearing has been retested. Activities associated with large pressure changes (sky diving, scuba diving etc) do carry a higher risk after the operation and it is probably safer to avoid these. Numerous studies show, in general, good maintenance of the hearing results over the long term. It is possible for the piston to dislocate and become displaced and any change of hearing, sudden or gradual, should be reported. In the event of displacement revision surgery generally carries a good chance of a successful restoration of hearing.